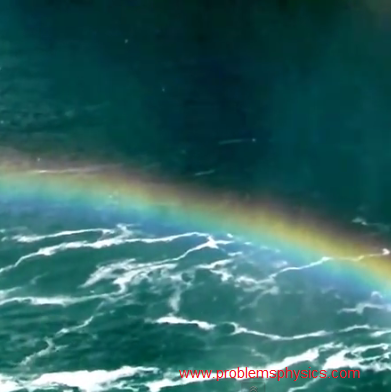 Light rays travel in different mediums at different speeds. In vacuum, for example, light travels at the speed of 3×108 m/s. This is the highest speed possible in physics. 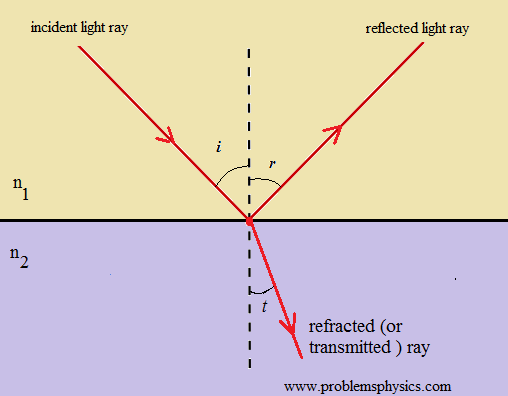 One of the most important parameters that measures optical properties of a medium is the index of refraction. It is defined as the ratio of the speed of light in vacuum (3×108 m/s) and the speed of light v in the medium in question. The refractive index measure the optical density of a given material. A material with higher refractive is more optically dense than a material with lower refractive index. What is the index of refraction in a medium where the speed of light is 1.5×108 m/s? What is the speed of light in water whose refractive index is 1.33? 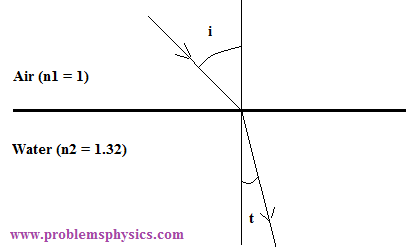 1) The incident ray, the refracted ray and the normal to the interface at the point of incidence are all included in the same plane called the plane of incidence. 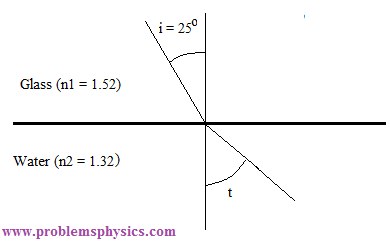 where n1 is the refractive index of medium (1), n2 is the refractive index of medium (2), i is the angle of incidence and t is the angle of refraction as shown in the diagram above. 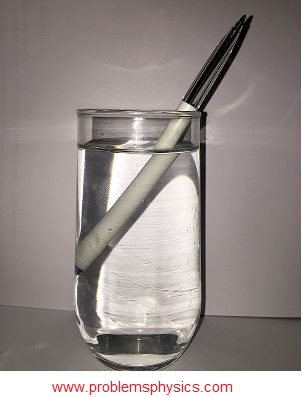 Refraction explains physical phenomena such the appearance of a pen bent inside a glass of water and the separation of white light into different colors such as the rainbow as shown below. A ray of light is incident through glass, with refractive index 1.52, on an interface separating glass and water with refractive index 1.32. 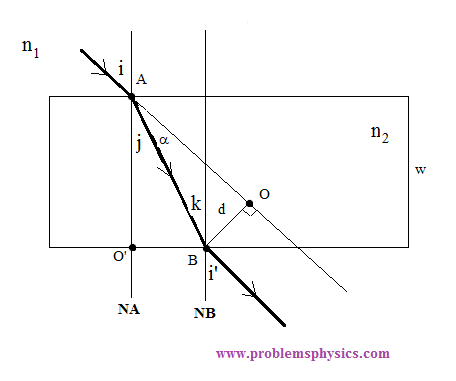 What is the angle of refraction if the angle of incidence of the ray in glass is 25 °? Assume refractive index of air is equal to 1.
a) Find i' in terms of i and show that the emerging and incident rays are prallel. b) Find the lateral displacement which is the distance d between the incident and emerging rays in terms of angle i, the refractive indices n1 and n2 and width w of the block. c) Use the formula obtained in part b) to calculate d for n1 = 1, n2 = 1.55, w = 3 cm and i = 32°. The incident and emerging have equal angles with the normals therefore the emerging and incident rays are parallel. Consider the right triangle ABO. c) Calculate d for n1 = 1, n2 = 1.55, w = 3 cm and i = 32°.